FeastHome – There are a lot of kitchen styles nowadays which all of them are attractive. One of them is a jet kitchen style. Never heard about a jet kitchen before? Are you curious how does this kitchen style look? Check these inspirations of a jet kitchen style and go apply it to your kitchen to have an attractive kitchen in your house. 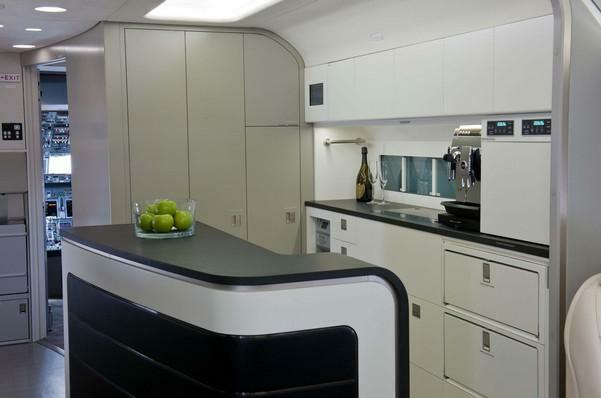 If you do not have many spaces in your kitchen area, you can follow this idea of a jet kitchen. This kitchen is dominated by white. And what makes it unique is because of the kitchen table and kitchen cabinets used. The kitchen cabinets on the side are unique and tall so that it is able to save a lot of tableware or kitchen utensils. Its shape is also attractive. 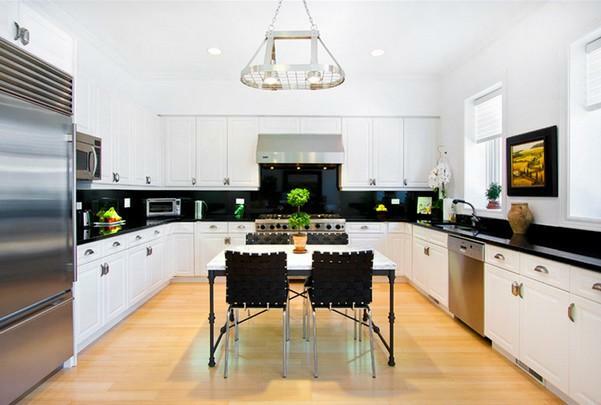 While the black and white kitchen table is bringing a style to this kitchen with both its colors and shapes. The curved shape makes the kitchen looks less boring and more stylish. 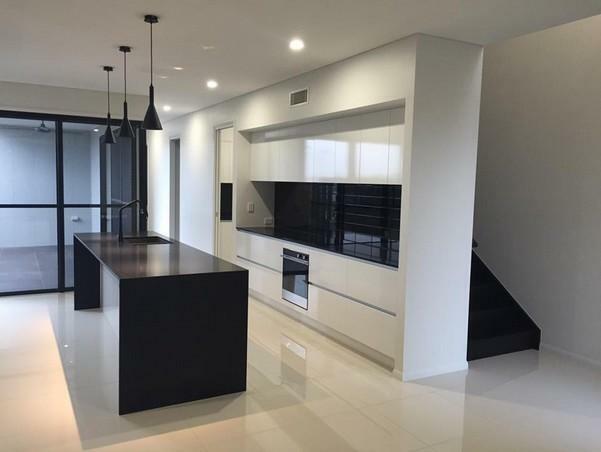 Monochrome style never goes wrong, even for a style applied for a kitchen. 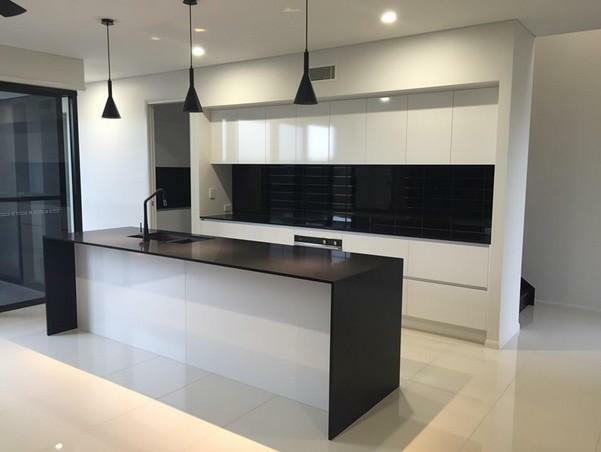 The kitchen in the picture above only uses 2 colors; black and white. So that this area looks very simple, minimalist, and modern at the same time. All of the kitchen elements in this kitchen such as the kitchen table, kitchen cabinets, and even the hanging lamps, have a sharp shape. Making the modern style looks even stronger. Moreover, the dim lighting accentuates the minimalist look. 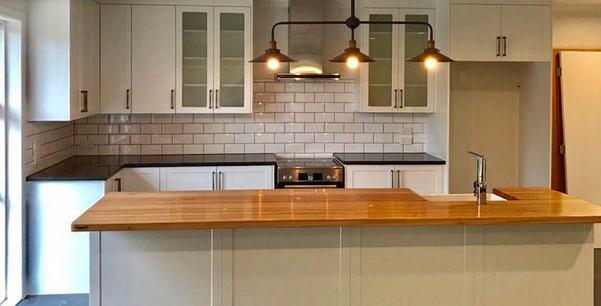 This kitchen might remind you about a kitchen in a professional restaurant. Maybe it is because there are 3 kitchen tables used. And look at the stove! It is a conventional stove but surprisingly it blends really well with the modern style in this kitchen. A lot of kitchen cabinets are also used so that a lot of storages to save the tableware and kitchen utensils are provided. 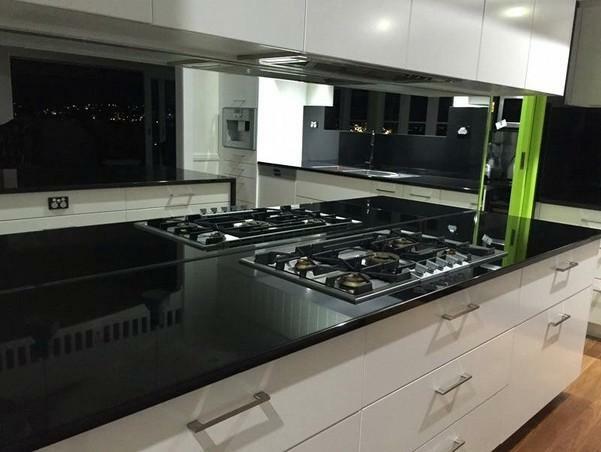 The black ceramic countertops are installed because a ceramic material is quite durable and strong, suitable for a heavy cooking activity. This kitchen area is already large, and the white color that dominates this kitchen makes it even more spacious and brighten the area. Because the kitchen area is already bright, the householders only use some small lamps on the ceiling. The dining area is located not far from the sink, it is even in the same countertop. Making it practical for the householders to put the dirty dishes into the sink. 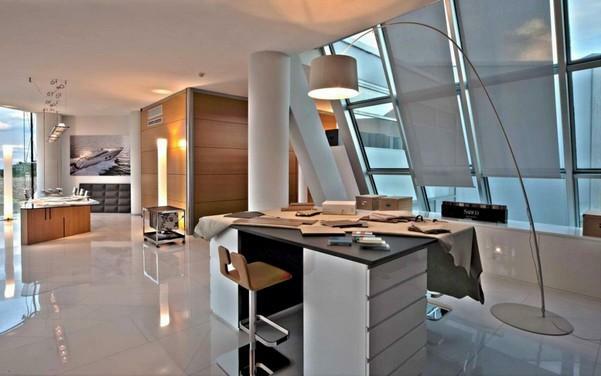 For you who have a spacious kitchen area in your house, you can apply this jet kitchen idea. The kitchen table and the sink are placed on the sides, while the dining table is placed in the middle of this kitchen area. 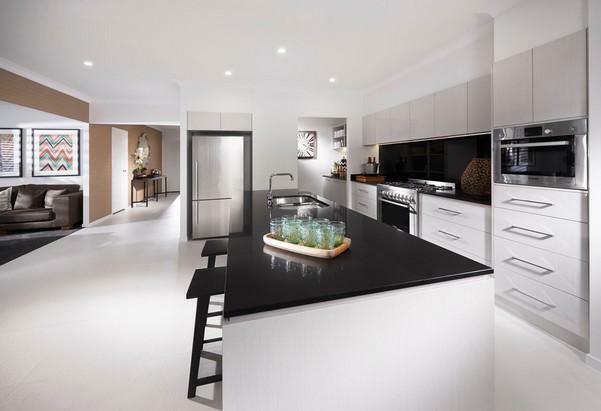 This layout is making it easy for the householders to prepare the ready meals and take out the dirty dishes to the sink. This area is quite small, but if you can see, there is a mirror in front of the sink. It is a great idea to make the area looks more spacious because the mirror will reflect the area. The bar chairs used as the dining chairs add style to this kitchen. Moreover, the wooden floor finely matches with the surrounding elements and brings a natural warm atmosphere. It is a detailed look of the monochrome jet kitchen in number 2. As you can see in the picture above, the kitchen is located right behind the stairs. The householders use the kitchen cabinets as a partition to divide the kitchen area and the stairs. If you have a limited area in your house, this idea might be suitable for you. The hanging lamps, the sink, and the countertop are all in black, creating a harmonious style in this kitchen area. The white marble tile floor is used so that the area looks more spacious. All the elements used in this area are making it looks super stylish. From the lamp, chair, table, asymmetrical window, and many more. The window allows the natural sunlight to come into the area in order to add a brightness there. But the curtains are provided just in case the sun is too bright so that the area will not feel too hot. This idea is suitable for a large kitchen area. 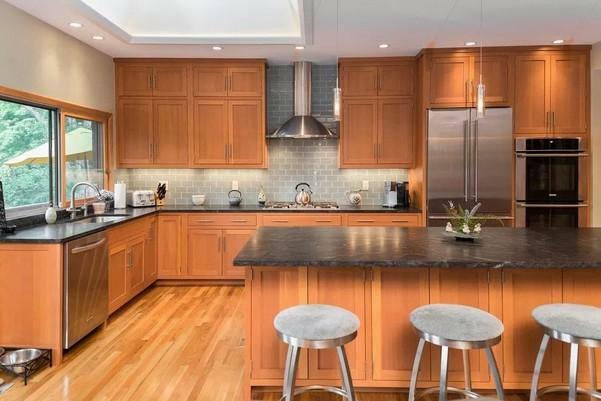 A wood material dominates this kitchen, making it looks very warm, traditional, and stylish at the same time. The kitchen cabinets, the floor, and dining cabinets are all made of wood. 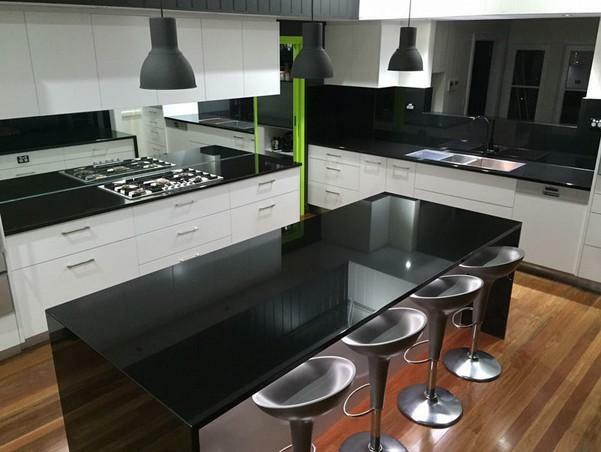 But a black marble countertop is chosen because marble is a strong and durable material. But the marble material blends very well with the wood material. The light tone of wood color is chosen so that it can instantly brighten the kitchen area beside making it looks warm and natural. The stainless steel cooker hood and fridge does not even ruin the style in this kitchen. First of all, the hanging lamps are so attractive, bringing an industrial look in this kitchen area. The white brick kitchen wall is adding a pattern in this area, making it looks more stylish and less plain. The glass kitchen cabinets are chosen in order to at the same time store and display the decorative tableware or kitchen tools. If you want to instantly decorate your kitchen wall, choosing a glass kitchen cabinet will be a smart idea. The white color that dominates the area, combined with the light tone of wood color from the kitchen floor, making this area looks so large and bright. The dining table with the anti-mainstream dining chairs is placed in the middle of the area so that the middle area will not look empty. The unique hanging lamp is placed right above the dining table, making the area looks stylish. The householders place a painting in the wall as the decoration. Those are the ideas of jet kitchen you can apply to have an anti-mainstream and attractive kitchen in your house.